With only three and a half days to prepare and 10 minutes to pitch, student teams worked feverishly to polish their solutions to this year’s unusual Monsanto case for Kogod's annual case competition this past Saturday. Teams developed diverse recommendations for moving Monsanto towards a sustainable and corporate social responsibility (CSR) focused company in Ghana, a country that in the past rejected Genetically Modified Organisms. However this year’s competition had a twist; the teams' solutions were guided by another company's strategies. "This year's case was less traditional in the prompt because it provides background knowledge using Walmart and asked students to then apply those lessons-learned to Monsanto," said Jennifer Zolla, a Kogod Center for Business Communications (KCBC) peer consultant. After evaluating Walmart, teams pitched ideas ranging from developing new cost-effective seeds that grow quickly in Ghanaian soil to implementing irrigation systems through out the country. Keeping the bottom line at the top of mind, many of the teams projected Monsanto improving its CSR, helping the environment, and increasing profits. A panel of judges, made up of local alumni and business leaders, scored each team out of 60 based on five areas: critical issues, evidence, recommendations, question and answer and overall impression. With cash prizes on the line, teams took preparations seriously. 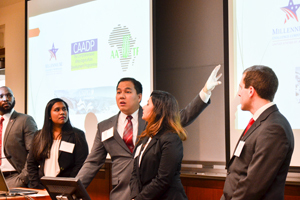 Over the preceding weeks, participants attended an array of events to assist in the case competition process. Panelists at events advised teams "not to take the obvious answer," and to "come with a mindset of sustainability and try to apply it to other functions in the business." The day before the competition, about three-quarters of teams signed up for an informal run through in the KCBC. Teams pitched to KCBC staff and received feedback on their organization, clarity and delivery before presenting to the judges. "The cases never have straightforward answers, but this year's was particularly complex," said Zolla, BSBA ’16, after helping teams prepare. After Saturday's competition, weary competitors spent Sunday catching up on sleep and homework. But third place Massachusetts division team member, Emmanuelle Palikuca BSBA‘19, looked ahead. "We’re happy that we started early," she said, "so we can gain experience and be more prepared for next year!"